We are now a couple weeks into our community engagement for 525 Moreland and the response we have received so far has been encouraging and overwhelming. Thanks to everyone who has participated. We hope you will spread the word and encourage people to get engaged. 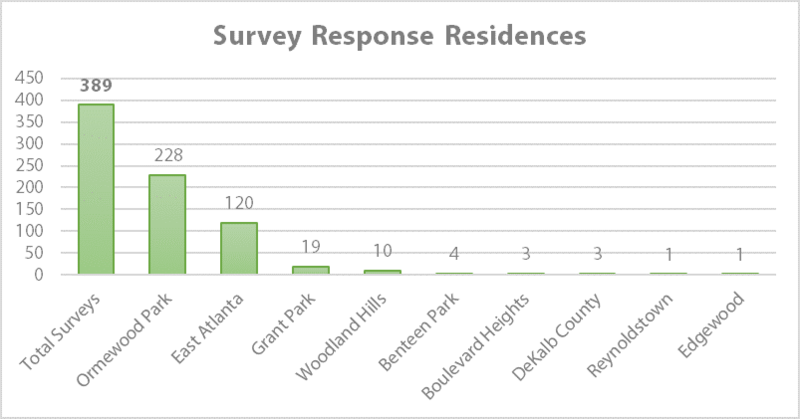 To date, there have been over 380 survey responses online and in person, primarily from Ormewood Park and East Atlanta residents. Thank you! It’s clear this site is important to a lot of different people with both diverse and common interests. Additionally, we conducted the first community design session on October 20th at Ormewood Church. A little over 30 people came out to help brainstorm possibilities for the project and share their concerns. After a background presentation, participants broke out into groups and were asked to provide 3 “wants” and 3 “don’t wants” for the project and then we opened the floor for discussion. We gained a lot of additional insights from these conversations that didn’t come through on the survey data. Links to the survey data and comments, Meeting #1 Presentation and Meeting #1 Feedback are included at the end of this post. Now that we have feedback from the first meeting, surveys , and online feedback, we are starting the challenging work of creating actual design concepts. This is a complicated site, but we are up for the challenge and excited about incorporating this feedback into the project to create a destination the neighborhood loves. Below is an update on the recurring themes we have heard from the community. Below is a summary of the major themes from the feedback and our responses. 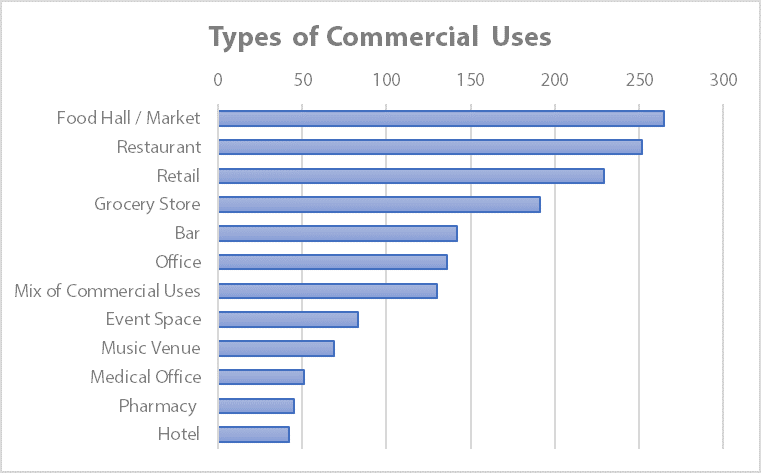 We heard this message loud and clear: the number one commercial use requested from the survey was Food Hall / Market. People liked the idea of smaller food and retail stalls from local vendors and also want a place they can quickly grab bread, milk, beer and wine. Additional comments on this subject requested absolutely no big box retail, more healthy food options than the fast food chains on Moreland, and for new uses to be “complementary, not competitive” to existing local businesses. The historic building at 525 Moreland was originally used as a Kroger on the first floor and Mason’s Lodge on the top floor, so a market/food-oriented use on the first floor would be a return to its roots. We are very supportive of this idea and definitely want to keep it local. Design diagram for the upcoming realignment of Moreland & Glenwood managed by the City of Atlanta Public Works and Georgia Department of Transportation. ﻿Nobody likes the current situation for cars, bikes, or walkers, at this intersection. The Glenwood offset increases the confusion and wait time for everyone and makes it particularly dangerous for pedestrians. It is a physical and psychological barrier between our Ormewood and East Atlanta neighborhoods. The intersection has been slated for realignment for almost ten years. Realignment will help traffic flow more smoothly (helping to alleviate many of the current traffic-related problems around the intersection), and should modestly improve pedestrian safety, although it will still be a heavily trafficked 5-lane road. The City of Atlanta recently acquired all of the land needed through eminent domain. We met with the Department of Public Works this week and they expect construction to begin by summer of 2019. The realignment is a project of the City of Atlanta and the State of Georgia, and is independent of our project, but we will seek to coordinate with it as much as possible and incorporate the design into our site planning. Portland cut-through traffic is exacerbated by the bad intersection at Moreland and Glenwood. Portland currently suffers from a lot of high-volume, high-speed cut-through traffic from drivers seeking to avoid the inefficient Moreland/Glenwood intersection. Additionally, the large amount of vacant property along Portland near Moreland (our site included) keeps this portion of the street empty and encourages high speeds. This creates a dangerous environment for the families and children living on the street. We’ve witnessed this and believe our project can help mitigate, if not improve, this problem. We are studying options, including landscaped bulb-outs, bioswales, and street parking along our 250 feet of frontage on Portland, which will effectively narrow the street and help slow drivers down. These measures are proven methods for slowing traffic. We are also studying ways we can manage or limit Portland Avenue access to and from our project. 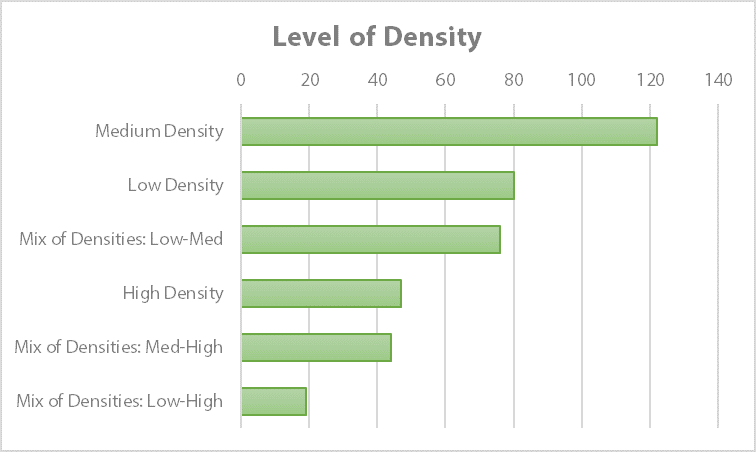 There is a large preference for medium and low density buildings here. Taken in the context of many comments preferring stepped-down density towards the single-family side of the site, this aligns with the South Moreland Livable Centers Initiative (LCI) Study and the Atlanta BeltLine Master Plan for Subarea 4 – medium density on Moreland, low density behind. This creates a “gentle density” transition across the site. UPDATE EDIT: Four of the 525 Moreland Assemblage parcels are zoned NC-2 (East Atlanta Village Neighborhood Commercial District) and four are zoned R-4 (Single Family Residential). All 8 properties are also in the BeltLine Overlay District. Create a low to medium density residential buffer on the west side of the site to transition well to the single family residential. We will incorporate this idea to integrate well with the neighborhood. The area needs more daytime uses like office space that are complimentary to the existing night life and restaurants of the area and gives residents a place to work locally. More office use in the commercial district will boost daytime activity and therefore other businesses in the district too. We agree and will explore how this project can contribute. Office use has a relatively low parking need and frees up on nights and weekends, an added benefit for this project in particular. There was a pretty consistent consensus that people would like to see the historic Masonic Lodge building restored and put back to productive use serving the community. Our primary objective is to restore the Masonic Lodge. It is a great building with a unique character and identity. We want to actually feature it as a central destination within the development. This commitment is at the center of almost every other project decision that will be made. Walkability and safety/visibility for pedestrians and bicycles is a high priority in the survey. The Moreland/Glenwood intersection is a long-standing concern for the community due to its hazardous conditions and inefficient design for the flow of multiple modes of traffic. We share the conviction that walking and biking should be promoted and enabled as a safe means of transportation. We will explore ways in which pedestrian and bicycle access into and within the site can be prioritized. We received numerous comments on the importance of public and green space that is only accessible by pedestrians. We are excited about how we can use public gathering space and pedestrian throughways as an amenity for this project, not just an afterthought. A definite priority for us too. Not everyone agreed on the amount of housing on the site (several wanted none at all). But for the folks that wanted housing, affordable and mixed-income housing was important. 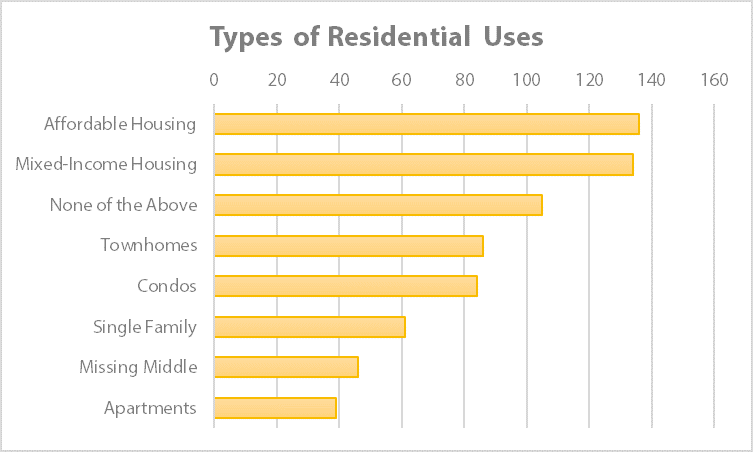 Respondents had different definitions of what this meant, some meaning subsidized housing and others referring to different price points that are naturally more affordable (i.e. smaller condos). Affordability also applied to multiple responses on the commercial space. We are advocates for housing affordability. We believe people should be able to live near work, which means having housing options. The site is within the BeltLine Overlay District, which has a requirement to include some affordable homes in rental developments. If there is a residential component, we will seek to meet or exceed that requirement by working with city and state agencies’ available subsidies. Providing naturally-occurring affordability in this market without significant subsidy and/or density is challenging, but we could include a range of unit sizes to create a mix of price points. We will also strive to include a mix of more affordable shared commercial space to promote small businesses. The subject of parking was more scattered than we expected. Half of survey respondents wanted structured parking and the other half wanted surface parking. Some noted in comments that it should be both. Some said there should be plenty, other said to add very little parking to incentivize alternate transportation. But one consistent theme in the qualitative comments was that parking should be concealed and not visible from the street. Structured parking is very expensive ($20-25,000 per space) so it usually requires higher density or higher rents to pencil out. There may be the possibility of providing public paid parking that is free for customers similar to Sweet Auburn Curb Market’s parking. But we will explore ways to realistically accommodate auto access and parking needs, while still prioritizing walkers/bikers. Parking provided on site will be concealed as much as possible. Please come to our next Community Open House meeting on November 3rd, from 11a to 1p, at Branan Towers (1200 Glenwood Ave SE, Atlanta, GA 30316). We will be holding a brief presentation at the beginning and then move to an open house format to present our first potential schemes for the site based on feedback received to date. Folks can come and go at a convenient time, to provide us important feedback on those options which we will then use to further refine them. We’ll also have a sketching table for folks to share more ideas on paper.